Clear acrylic gift box. 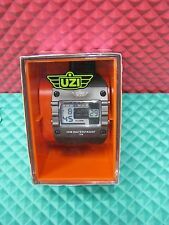 Uzi Digital Sports Watch By CampCo. 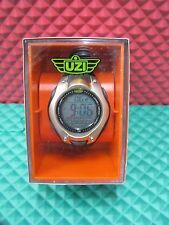 Uzi Digital Sports Watch By CampCo. Clear acrylic gift box. UZI mans sports watch black rubberized wristband. • 30 m waterproof. • stop watch. New Uzi Guardian Watch Black nylon wrist strap. Features enlarged digital readout, lighted dial, alarm and stopwatch. Stainless back. Black finish stainless bezel. Water resistant to 50m. So we wish for you to only to have a positive experience. You can count on your UZI watch to perform in any situation and expect it to excel in low light conditions with the bright back glow. 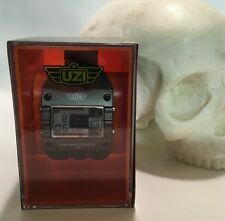 If you want a watch that truly sets you apart from the crowd, UZI watches will get the job done! Digital display. Features cold light, mode setting, reset, 12/24H, stop watch, alarm and date. Water resistant to 30m. Stainless back. Black rubberized wrist band. Clear acrylic gift box. So we wish for you to only to have a positive experience. UZI Guardian Watch. Black nylon wrist strap. Features enlarged digital readout, lighted dial, alarm and stopwatch. Stainless back. Black finish stainless bezel. Water resistant to 50m. Color: Black. Duration: 1 month. Australia, Belgium, Brazil, Canada, Croatia, Denmark, Estonia, Finland, France, Germany, Gibraltar, Great Britain, Hong Kong, Hungary, Ireland, Israel, Italy, Japan, Latvia, Lithuania, Luxembourg, Malaysia, Malta, Netherlands, New Zealand, Portugal, Singapore, South Korea, Spain, Sweden, Switzerland. Wrist watch is finished in grey. Australia, Belgium, Brazil, Canada, Croatia, Denmark, Estonia, Finland, France, Germany, Gibraltar, Great Britain, Hong Kong, Hungary, Ireland, Israel, Italy, Japan, Latvia, Lithuania, Luxembourg, Malaysia, Malta, Netherlands, New Zealand, Portugal, Singapore, South Korea, Spain, Sweden, Switzerland.